Please note that we have no private parking of our own. 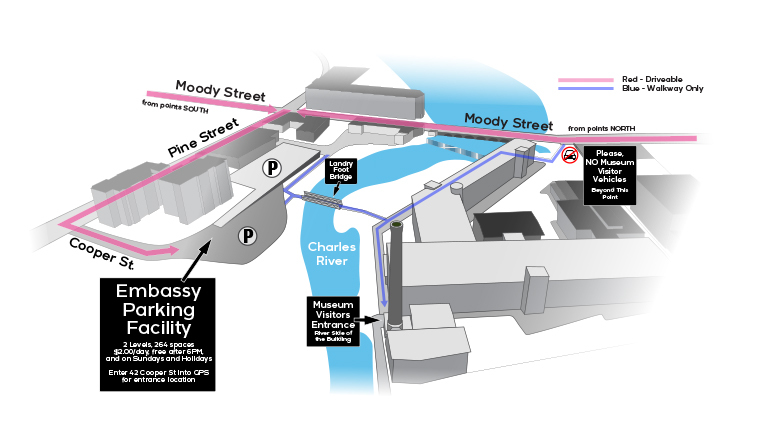 Your BEST parking option for a visit to the Charles River Museum of Industry and Innovation is the Cooper Street / Embassy Parking Facility, on the southern bank of the Charles River, accessible at the end of Cooper St., just off Pine Street, which is a cross street of Moody. - CLICK HERE TO SEE A GOOGLE MAP for PARKING DIRECTIONS! Once you've parked in the Cooper Street lot or the adjacent Embassy Parking Garage, all you need do is take a short but thoroughly enjoyable, scenic walk on the Landry footbridge across the Charles River, turning to your right (to the East) after you've crossed, and you'll see the Museum entrance about 100 yards ahead. Enjoy your walk along the Charles! - Please note that the footbridge is clearly indicated on the map below, immediately above (north) of the Embassy Parking Facility. Please click on the map above for a PDF that you can print and carry with you. In addition to the Embassy Lot, there are numerous other off-street public parking lots in downtown Waltham, as well as a good amount of on-street parking. Please visit our Directions Page which includes a map that shows many of the other nearby parking lots.